NGC 3293 is the open cluster in the top right corner while the filamentary nebula in the bottom left corner is a Wolf Rayet nebula around WR 23. NGC 7214 is an ordinary edge on spiral galaxy with a star forming dwarf companion seen in projection right in front of it. Using multiwavelength kinematic and photometric data we have analysed the gaseous and stellar properties of a previously uncharacterized low-mass star-forming companion and newly discovered stellar stream seen projected against the edge-on spiral galaxy NGC 7241. The companion object was identified serendipitously as an offset velocity component in H α Fabry–Perot observations along the line of sight to NGC 7241, and is most prominent visually in UV and blue wavelengths. The ultracompact HII region ECX6-38 can be seen near the right edge with the planetary nebula K4-55 above it. 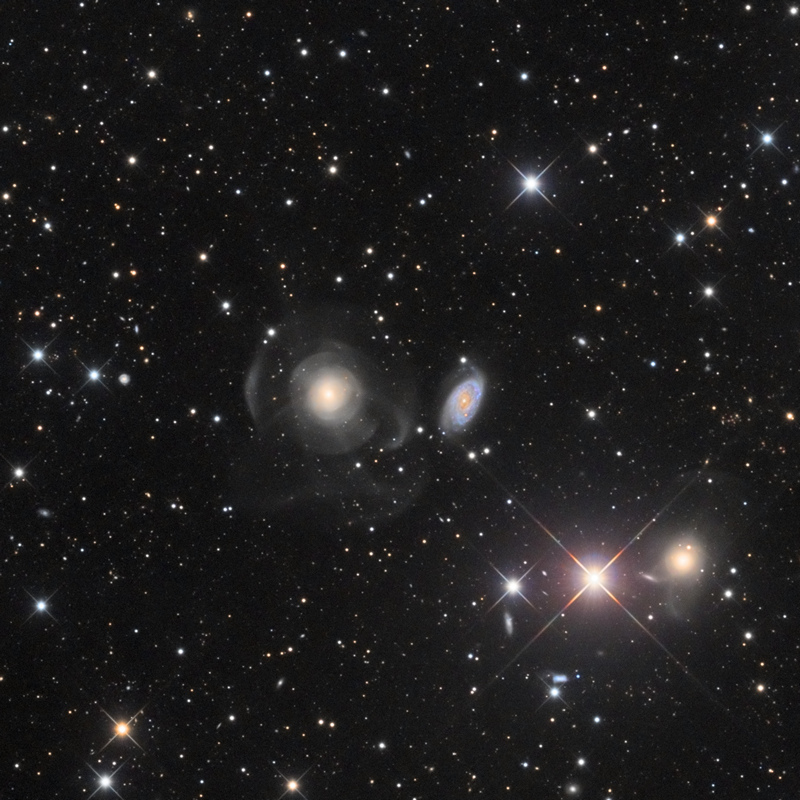 As far as galaxies are concerned, size can be deceptive. Some of the largest galaxies in the Universe are dormant, while some dwarf galaxies, such as ESO 553-46 imaged here by the NASA/ESA Hubble Space Telescope, can produce stars at a hair-raising rate. 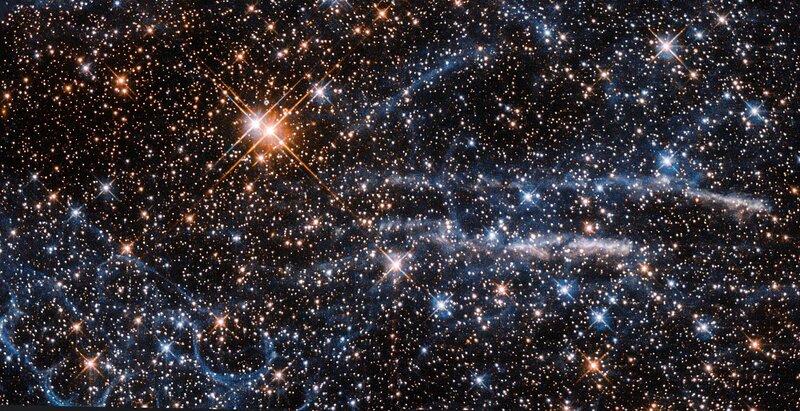 In fact, ESO 553-46 has one of the highest rates of star formation of the 1000 or so galaxies nearest to the Milky Way. No mean feat for such a diminutive galaxy! 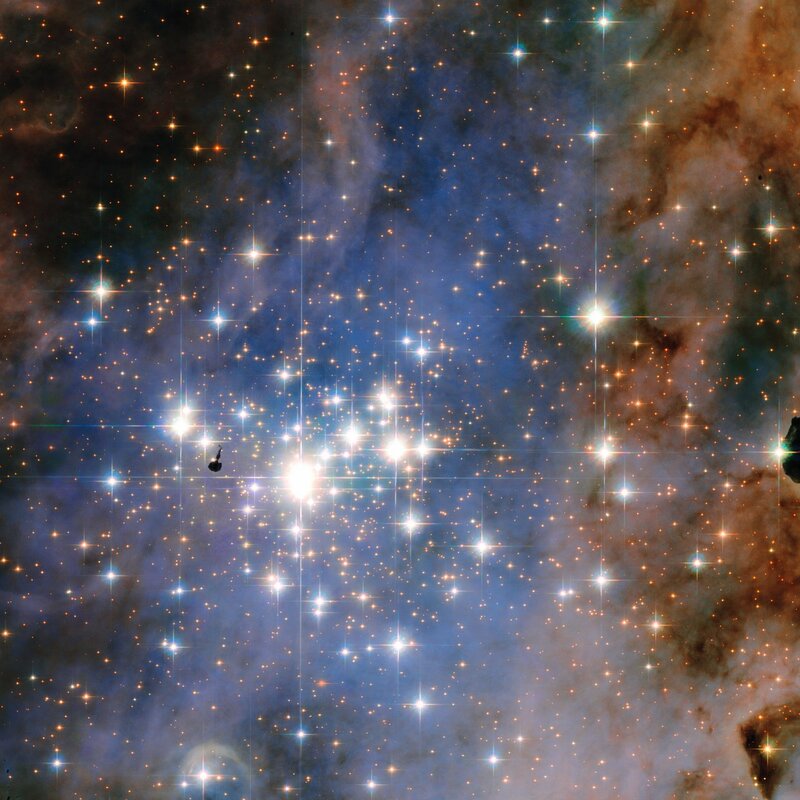 Clusters of young, hot stars are speckling the galaxy, burning with a fierce blue glow. The intense radiation they produce also causes surrounding gas to light up, which is bright red in this image. The small mass and distinctive colouring of galaxies of this type prompted astronomers to classify them, appropriately, as blue compact dwarfs (BCD). 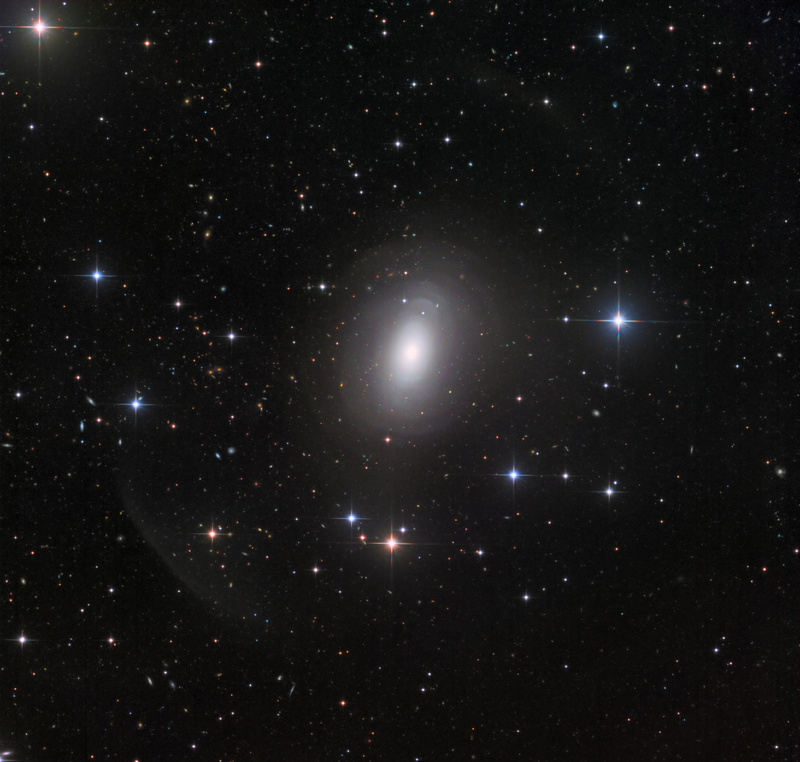 Lacking the clear core and structure that many larger galaxies — such as the Milky Way — have, BCDs such as ESO 553-46 are composed of many large clusters of stars bound together by gravity. Their chemical makeup is interesting to astronomers, since they contain relatively little dust and few elements heavier than helium, which are produced in stars and distributed via supernova explosions. Such conditions are strikingly similar to those that existed in the early Universe, when the first galaxies were beginning to form. B169 is the dark nebula in the middle and B174 is to the left of it. 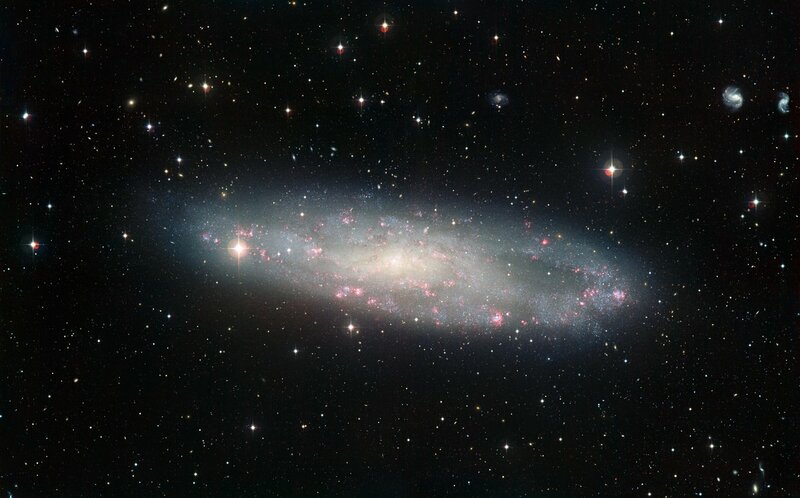 In contrast to the image of NGC 2623 released in 2009 (heic0912), this new version contains data from recent narrow-band and infrared observations that make more features of the galaxy visible. 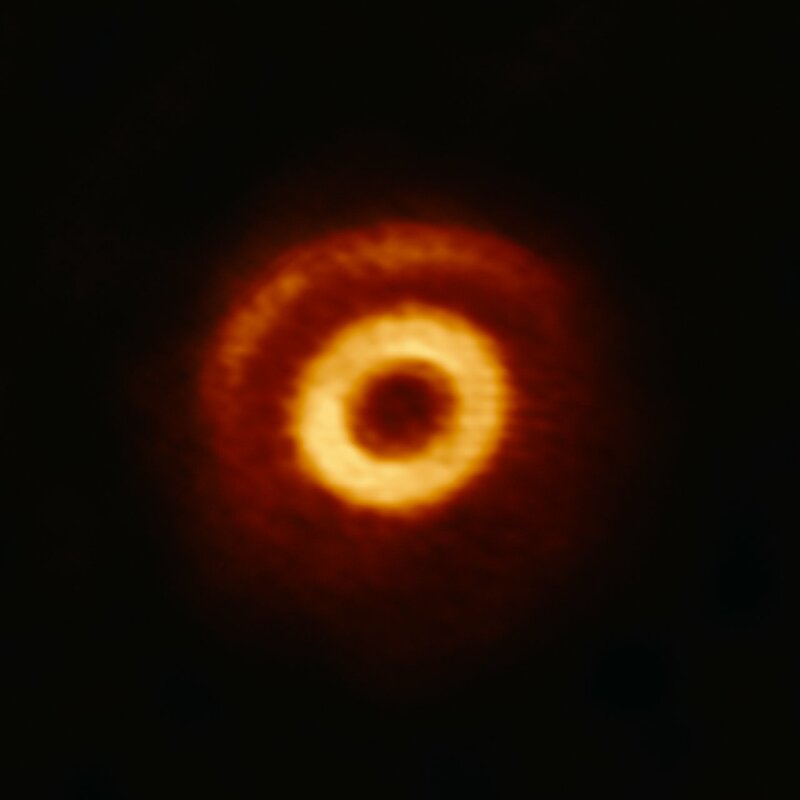 This image from the Atacama Large Millimeter/submillimeter Array (ALMA) shows V1247 Orionis, a young, hot star surrounded by a dynamic ring of gas and dust, known as a circumstellar disc. This disc can be seen here in two parts: a clearly defined central ring of matter and a more delicate crescent structure located further out. That's the kind of thing I'm expecting from Tabby's star, eventually... just a very, very lucky alignment of an unusual disk. Another amazing image from ALMA.